Optimised growth is equally important to profitability for Australian FB feeder producers, who usually sell on a $$-per-kg weight basis to feedlot buyers. A common specification calls for purchase or induction under 15moa at a minimum weight of 250-300kg. However, early FB growth variability is as pronounced as the terminal weight variation in FB carcasses identified above. 200doa FBs commonly vary from about 150kg/lwt to over 200kg, with a likely average around 170kg. 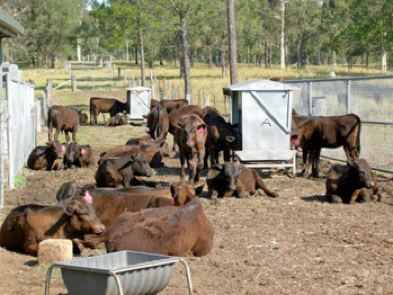 Higher growth weaners may weigh 210kg, with greater ongoing daily gain, while lower 200doa lwt animals frequently also record lower average daily gains (ADG). Most FB feeders will require supplementation from weaning to shipment. Australian FB 200-300 day weights are not significantly different from those recorded in Japan – but Japanese calves are likely to have been supplemented for many months at this point. The following table describes the indicative pre-shipping backgrounding or paddock supplementation time required for lower 200doa lwt/ADG weaners compared with representative animals with higher weaning lwt/ ADG. DOF indicates the length of preparation period required. Depending on ration costs, higher growth animals may be supplemented longer for higher induction weights and better profits. No ration cost/shrinkage is calculated, but clearly substantial time (and subsequent ration cost) penalties are accrued by low growth genetics.